Nearly nine months of living out of a suitcase, hopping on planes, ferries, scooters and the back of pick up trucks. Nearly nine months of traveling around the world and it officially comes to a close tomorrow. How am I feeling? It’s bitter sweet. Having nine months to experience traveling the circumference of the globe with my son and husband is something I’ll never forget. It’s an experience that I’m ridiculously grateful for. It is a great big world out there my friend, but what sticks with me the most? Kindness. The simple act of kindness that costs nothing and benefits everyone. It may take three seconds or three minutes, but the act of kindness is a conscious choice. Think about that. It may be holding the door for someone a few feet behind you, returning a ten dollar bill that fell out of the pocket of the person in front of you or as simple as smiling at the person at the cash register. Kindness costs nothing and holds unbridled positives. Traveling out of a suitcase in places on the map where you know no one can be lonely. It can be very lonely. I learned a great deal about myself and others in nine months that challenged me in ways unlike never before. It isn’t healthy to feel like an island disconnected from others and not part of something. It is not how we were meant to go through life. Before leaving the States and during our journey I sent out over a hundred emails and messages to people abroad with the intention of connecting as either a volunteer, getting plugged in during our month stay or just to meet up with fellow ambassadors of kindness. I was disheartened with how few responded to me. I also reminded myself of how busy we can be when we’re, well, busy. Life is crazy and when working, the pull of life’s responsibility and home it can make your head spin. As humans we can be crazy busy, but one email can go a long way. I truly never realized how impactful our communication, our ability to even briefly connect can have on the human heart. 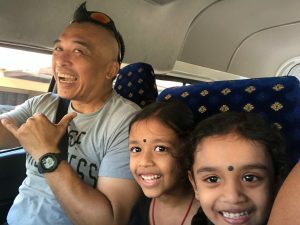 Connecting with a friend of a friend in Malaysia who allowed me to tag along with him for the day observing his outreach program and spending time with his family. Kindness comes in many forms. It can never be overrated. A simple gesture, a small extension of ourselves can impact another human being in ways we can often underestimate. There are so many hurting, overwhelmed people in the world. Each of us regardless of our mindset, background or where we reside NEED various forms of kindness bestowed upon us. It’s as simple as that. So what does this all break down to? Know that it’s ok to reach out to connect with others for a cup of coffee, to take a simple car ride running errands or to just be in the presence of another person who makes you feel good about yourself. There’s nothing weird or strange about extending ourselves to others. Push those thoughts out of your head. We need kindness. All of us need it. We also should strive to instill kindness into all aspects of our life. It’s a game changer…. Kindness can be formed into a lifestyle, but it may take time. It’s ok to remind ourselves daily about its relevance in our lives. That may range from placing post it notes in visible areas, praying about maintaining this mindset or focusing on gravitating towards those who have assumed a lifestyle of kindness. A kindness bucket list. Have one and it will get the ball rolling faster than imagined. Seriously. What are ten, twenty or even fifty ways to go through the next month spreading kindness? When we get in the kindness zone it’s easier to assume this as a lifestyle. It’s also an easier way to tend after our own mental health. When we focus on others and get excited about things such as spreading kindness it does unbelievable positives for our state of mind. Pretty amazing, huh? The simple act of kindness that costs nothing and benefits everyone. Let us remind ourselves of that every single day. Kindness matters. Smile, extend a wave and seek out the kindness of others when needed. We all need it. Wishing you a day of peace, love and overflowing kindness!